So we said it’s going to launch sometime in calendar, but not within Fiscal 11. So that basically pens down between you know, April 1st and December 31st of this calendar year. It’s also reasonable to infer that it’s not in our Q1 guidance. We gave Q1 Fiscal 11, Fiscal 12 non-GAAP revenue guidance, minus 39 minus 44 cents and I think it’s not unreasonable to infer that it’s not included in that 90 day period. You need months of different flavors of beta testing to making the product generally available. We’re really focused on providing a great user experience, because not only do we want to retain, kind of the core tier 1 users. We want word of mouth reference ability to bring in tiers 2, 3 and 4. Given we’re only at closed beta so far, July is probably a pretty optimistic launch month as well. 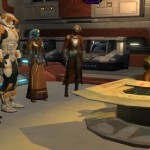 There’s the cohort of observers saying 2012 will be the year for SWTOR. I’m not that pessimistic but it seems a pre-Xmas launch may be about the best to hope for. I am of course very happy to be proven wrong. I can wait. A polished and complete product is what needs to be released, and by complete I mean complete for levels 1 through to cap because we all know that an mmo is never really complete due to expansions and updates. Too many mmos have release with advertised content not making it into launch, where it feels like they’ve released it early to get subscribers to pay for essentially a beta testing phase. I say to Bioware, “Take what time is needed to create an exceptional launch. Take, your, time”. We all have been waiting since we got accepted for Beta late 2008.
this game should also be playable on the ps3 and xbox 360. More people would play it because i personally despise computer games its just not as fun. and im sure there are others out there who feel the same if u made it for the pc and the consoles more people will buy the game when it releases. It would be great for the console users to be able to play this game on a PS3 or Xbox360. It would certainly mean more players would be playing TOR. However, I think it would mean the game would have to be ‘reduced’ somewhat to cater to the limited options that a controller has compared to a pc and its keyboard. Dispise is a strong word. I have a PS3 myself and if I had the choice of playing on PC or PS3 I would choose PC every time for an mmo. Being able to converse in game would certainly be much easier with a keyboard and in MMO’s the amount of abilities a character has would certainly be an issue with a controller also. However, I’m sure you do not want to hear my opinion on why it appears to me it would not work without the game being ‘reduce’. I will say that, if they could do it and keep the high level of content and options in game while supporting PS3 and Xbox360 I would not stand in the way. I would welcome the addition to the community. Darth, the PS3 has voice capability as well. The only online game that I’m personally aware of as being cross platform as well as pc is FFXI. That being said, DC Universe Online while being out for ps3 as well as the pc, has completely sepperate servers. I agree on the “reduced” thing when putting it on consoles but the ps3 already has a keyboard product. Couldn’t they use it for this kind of game? If not improve it so it’s possible? But I don’t about Xbox if it has a keyboard or not. Axzaril is right take your time because if you rush into it then the games graphics wont be as good as they would if you take your time. Sure i wanna play it but id rather play it with really good graphics and exceptional game play. In a nut-shell, we haven’t got a bloody clue when this thing is coming out. And we don’t have any idea what’s holding it up either. This isn’t about being finished or polishing, this is about something completely intangible and internal. The longer they wait, the more problems they will have. Testing does not find all the problems. Test too long and you only make the problems that much harder to fix. Once they start adding changes to changes, it becomes more difficult to dig through the layers to get at the problems once they are found. Personnally, I suspect that there are “too many chefs” and the “soup” is in danger. was put into motion in 2008. WHAT HAVE THEY BEEN DOING THIS WHOLE TIME?? before the game actually launches anything. Actually this is better, I have class and a life I need to focus on. People can only be patient for so many years. Who knows, maybe the world will get to the actual Star Wars-ish era before this comes out….wouldn’t that be ironic. Hi there – just one clarifying point: it’s me that’s said to hope for a pre-Xmas launch, not EA. EA have just confirmed a window that could be as late as then. My guess (and it’s all a guess besides knowing its July at the earliest) is Aug/Sep. This is a MMORPG, if you learn anything from playing one, you should have learned this. MMORPGs are FOR Computer systems, not Consoles. Care less if it is on Xbox, PS3, or otherwise. Never understood why people spend the money they do on consoles, when you always COULD, and always WILL be able to do it on a computer. While I do agree with you that MMORPG’s are made for PC’s primarily we will likely see in the future MMO’s branching out to consoles, DC Online springs to mind, I have never played it btw. My issue with porting an MMO over to consoles that is also being made to play on PC’s will mean the mmo will probably need to be dimished in it’s options and content due to the limitations with consoles. However, this does not make Michael’s desire to have it on consoles not valid. We have to keep in mind that gamers do not all own PC’s for gaming. There are a large amount of gamers that solely play on consoles. They see something that interests them like TOR and want it to be able to go through their gaming medium, the console. We also have to keep in mind that Bioware is creating an MMO that will likely attract a lot of people that have never played an MMO before, so their understanding of MMO’s and what they demand will be minimal. We have to keep an open mind, everyone will not fit into your idea of what a gamer should know and saying that you could not care less does not help this discussion, it only creates negativity. I just hope that there will be some sort of end game content at launch so you will have something to do if you buy a second month. specific to STAR WARS. But we’ll see. I have been looking forward to The Old Republic for a while now, and I have been following the games production for around a year. After watching the new Gameplay Video from PAX East in Taral V, the game is just starting to look good enough for me to want to play. Now about the release date, I couldn’t care less. I agree that Bioware should take their time and release the game when they are ready. But, if the devs of TOR want to calm the millions of fans waiting for them to set a release date so that they can mark their calanders and save their money, they should just send out an estimated release month. I’m sure that with all of Biowares resources, they can calculate (or at least gestimate) a resonable time for the game’s release, or even an open beta. It doesn’t have to be completely accurate (hell, they can state that when they reveal the information) just something to give TOR hopefuls something to look to, and stop it from writers having to guess a release date (almost) at random like chickens with their heads cut off. Im not sure if that would be a wise idea. I mean, it for sure would be an awesome suggestion if they knew a more accurate release date, but when they keep changing the season it shows you how unsure of the release date they are. As much as I wish this would be released already…. It’s a blessing since I graduate this summer, and don’t need this game as another excuse not to go to class. My patience will be tested, but the last moments of my bachelor’s will be greatly improved. I had heard rumors about this game in 2008 and i thought it was to good to be true seeing as KOTOR was an amazing RPG and still is. Now that they are taking the bases of that game and turning it into an MMO was mind blowing. Then i want to say it was about 2009 when they had came out with their SWTOR website and of course i signed up for it immediately! At this point Im constantly checking up on the website and ive been doing this for 2 years LOL! Also ive been a casual WoW player since 2004 so i believe its time for a new MMO to take the throne and out of all the games that ive seen over the years trying to compete with WoW, SWTOR will be its best competition. 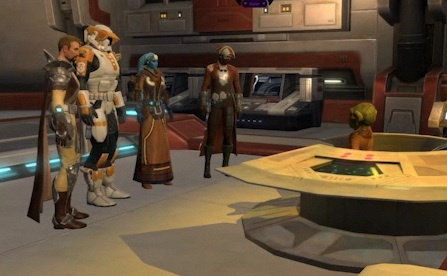 I really do believe Bioware and Lucasarts are creating the next generation of MMORPG. It takes alot to make a great… NO an EPIC GAME!! (it took WoW over 4 years) i cant wait for this game to come out but i understand Bioware and Lucasarts are going to PERFECT their first MMO so dont be surprised if we have to wait till 2012. I have been following the progress of SWTOR since I was laid off 2 years ago. I signed up on dec 2008. So I have been waiting 2.5 years for this. I understand we all want it to come out. However I do not want the glitches that KOTOR II had at the end. That game was riddled with problems that they NEVER fixed it was frustrating. I still can not play knights of the old republic II on the dark side and finish the game too many glitches. i would rather they take there time but I would like open BETA to start. I put my name in the second day they announced beta sign up and nothing.. they should be picking people for beta now Alpha testing should be over by now. Sheesh. I just want to play even if its beta. arrg. I guess my system is not snazy enough for them. everquest worked great bac when it was on the ps2 so i see no prob with this working on ps3 console.